Age restrictions: Child aged 3 – 15. Children under 16 years old must be accompanied by an adult (18+)Children under 3 years old go FREE but will require a ticket, please ensure that this is requested when booking. Opening hours: Daily: 11am to 6pm (last rotation). Pick up point: Please take your voucher/confirmation along with photo ID and credit card used for purchase to the Voucher/Pre-booked Desk located in the Ticket Office inside County Hall, directly opposite The London Eye. Here you will receive your boarding pass for the next available flight.Once you have exchanged your voucher, please join the boarding queue at the London Eye.IMPORTANT: This is a ‘Voucher’ and not a ‘Ticket’. Please take your voucher and redeem it for a timeslot/ticket to ride. It is recommended that at Peak Times and weekends you should exchange your voucher for a pre-booked timeslot as soon as possible to avoid disappointment. At 135 metres, the Coca-Cola London Eye is the world's tallest cantilevered observation wheel, offering breath-taking 360 degree views of the capital and its famous landmarks. The gradual rotation in one of the 32 high-tech glass capsules takes approximately 30 minutes and gives you an ever changing perspective of London. Within each capsule, six touch screens powered by Samsung Galaxy Tab 10 allow you to explore the capital's iconic landmarks in several languages. 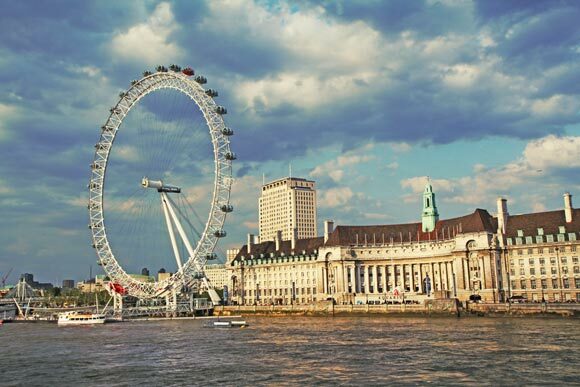 An experience on the Coca-Cola London Eye will lift you high enough to see up to 40 kilometres on a clear day and keep you close enough to see the spectacular details of the city unfolding beneath you. There are 32 capsules in total each one representing one of the London boroughs. However they are numbered 1-33 with the number 13 missing due to superstition regarding the number. The London Eye is often mistaken for a Ferris wheel but it's actually a cantilevered observation wheel as it is only supported on one side. It is the largest in the world. The eye was constructed in sections that were floated up the Thames on barges, once assembled it was then lifted in to place. The Eye attracts more visitors than both the Taj Mahal and the Pyramids of Giza with over 3.5 million people experiencing its views every year.